Preachers and congregations who follow the lectionary and the liturgical calendar have a choice to make for the Sunday prior to Easter. On one hand there is the possibility of celebrating the Triumphal Entry. Palm Sunday can be a glorious celebration in itself. We can wave palm fronds and shout praises to the king of kings. On the other there is Passion Sunday, which allows congregations—many of which will not have a Good Friday service (congregational or community service)—to consider the crucifixion of Jesus before gathering for the great celebration of Christ’s resurrection. Skipping from triumph to triumph neglects the reality of suffering, both that endured by Jesus and that endured by humanity and even creation itself. 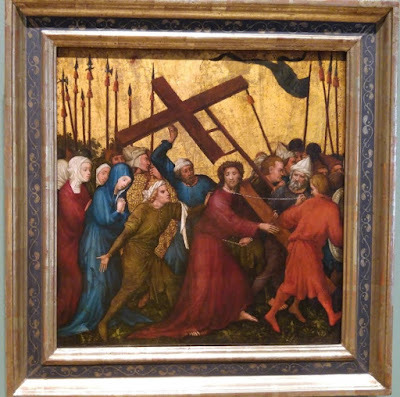 Somewhere in Holy Week we need to lift up the cross and ask what the cross has to say to us about the nature of our faith. Since I am focusing my lectionary reflections on the First Reading, which is generally taken from the Hebrew Bible, I am left with the reading for Passion Sunday, as there isn’t a Palm Sunday reading from the Hebrew Bible other than the reading from the Psalms. So, with Passion Sunday being the only choice I have, I will focus my attention on this third Servant song of Second Isaiah. While there is no consensus as to the identity of the servant who is referenced here, it is appropriate that we consider the prophet himself to be the servant (the traditional alternative is Judah, but I think the prophet makes more sense, at least in this particular song). If we begin with the premise that the servant present in this song is the prophet, then how might we interpret this passage in light of Passion Sunday? How might the cross emerge here? The Servant Songs of Isaiah have traditionally been applied to Jesus, to give theological meaning to his sufferings on the cross. This is appropriate as long as we do not discount its original reference point. It is not as if this passage lay unfulfilled until Jesus arrived. Isaiah begins by identifying the servant as teacher, and Jesus is understood to be, first of all, a teacher. He is addressed on multiple occasions in the Gospels as Teacher or Rabbi. We know him in his teaching role, sharing the news of God’s realm through parables (synoptics) and through sermons (John). As a teacher, Jesus offers a word that sustains and uplifts the weary. Not only does he teach, but Jesus faces opposition and oppression. Those who speak need to be excellent listeners, to God and to those to whom they speak. We need an open ear when we listen to God in our prayers, in our studies, and in our attempts to live out in word and deed the faith that is ours. Too often in prayer all we do is talk. There is a Jewish saying that study is a higher form of worship than prayer, because in studying we listen to God while in prayer, the only thing about us that is open is our mouths. [Allen and Williamson, Preaching the Old Testament, p. 39]. As this is Passion Sunday, the teacher in question is Jesus. He is the one with the open ear, listening to the people and to God, bringing to us a word that sustains the weary. That those called to the preaching/teaching ministry are given the same task, requires of us that we look to Jesus for guidance and as an exemplar. The teacher (the prophet) listens to the people and to God. He does not turn his back on God, and yet not everyone is ready and willing to hear his teaching. He commits himself to bringing a word that sustains, but instead of this word being received, he is humiliated. His back is struck and his beard his pulled out. It’s understandable, in light of the story of Jesus’ trial and crucifixion, why this passage would be chosen for Passion Sunday. Jesus is, after all, a teacher, who listened to the voice of God and shared God’s word with the world, not all of whom were willing to receive it. He was flogged and beaten and humiliated. To borrow a phrase from the African American community that refers to someone who has become aware of our society’s injustices, the prophet was literally “woke.” If the church is to have the mind of Christ and the spirit of the Servant, it must also awaken to contemporary social injustices, while equipping itself to speak the truth about these injustices effectively. [Green, et al, Connections: 2 (Kindle Locations 3866-3869). Presbyterian Publishing. Kindle Edition]. If the word that is required will make people uncomfortable it’s no wonder that this calling is accompanied by suffering. While the cross isn’t mentioned here, we can infer it in the case of Jesus. It comes about after Jesus is fully humiliated, due to his teachings of the kingdom, a teaching that did not sit well with those in power. This suffering is not endured for the sake of suffering. It isn’t sought out. The servant doesn’t have a martyr’s complex, but he is willing to endure the suffering because he believes he will be vindicated. Because the LORD helps him, he won’t be “put to shame.” The servant asks: “who will contend with me?” Where are the prophet’s enemies? The prophet invites them to confront him. He’s not afraid, because God helps him. God will vindicate him. So, who can declare him guilty? As we approach the passion of Jesus, we will hear the story of Jesus’ humiliation, along with his suffering and his death. This is a central piece of the story that defines our faith. When they lay him in the tomb, all will seem lost. Or is it? If we would turn to the words of Paul in his Philippian letter, a passage that is designated for the day, we will hear a word about Jesus emptying himself of his prerogatives of being equal with God, taking on the form of a slave, and being obedient to the point of death on the cross. That is the first word, but it is not the final word. Paul on to declare that “God so highly exalted him and gave him the name that is above every name, so that at the name of Jesus every knee should bend, in heaven and on earth and under the earth, and every tongue should confess that Jesus Christ is Lord, to the glory of God the Father” (Phil. 2:5-11). Or, as Isaiah proclaims, “it is the Lord God who helps me; who will declare me guilty?” (Is. 50:9a). With the promise that "Vindicator is Near" let us begin the journey that is Holy Week.